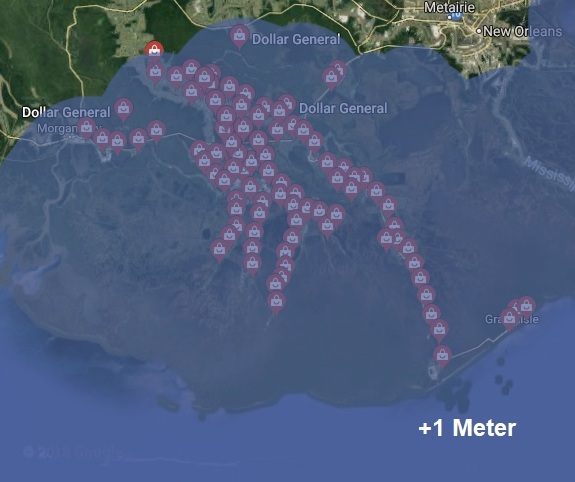 A recent study concluded that the parishes of Terrebonne, Lafourche, and St. Mary could experience a sea level rise of one meter within the next thirty years. This would put the 10,000 Dollar Generals that are slated to line Louisiana’s southeastern coast in a perilous situation. Economists predict South Louisiana’s quickly-shrinking working class isn’t expected to be fully eradicated until 2065. Tragically, if sea levels rise before then, these Dollar Generals would be destroyed before they could finish converting the dwindling wealth of the local economy into out-of-state corporate profits. It’s devastating. We are competing with mother nature, racing to see who can wipe these people out first. If we’re gonna beat that salty tide of destruction by 2050, we have to either lower wages or lobby for more tax breaks. Frankly, both are pretty easy to do in this state. As people get more desperate, we can make them work harder for less. The average employee makes around 9 bucks an hour, but their labor produces close to 16. That’s a difference of about 7 bucks that goes right into the pockets of upper management and shareholders. We’d like to get that number to around 10 by the year 2025. Also, getting taxes lowered should be a piece of cake. Louisiana already exempts over 80 percent of corporate taxes anyway, which means our employees usually end up paying a higher percentage in taxes than we do. It shouldn’t take much lobbying to get more tax breaks. With less revenue flowing into the state, healthcare, education, and infrastructure will continue to crumble, producing the depressed economic climate our stores thrive in. If we can continue to exacerbate these conditions, we should be able to finish milking these communities of what little they have left just before the Gulf of Mexico comes for them. Thank goodness I have already died and I won’t have to live through this too! Thank goodness I have already died and I won’t have to live through this tragedy too! Me thinks no one is visiting this site. Say it isn’t true, L. Ron!